Plymouth City Council is committed to delivering high quality services in a fair and equal way to all sections of the community. A review highlighted that enhanced processes and better management of resources and infrastructure would improve service efficiency and availability, allow prioritisation of services, and ensure better quality assurance. This would enable the Council to save money while better serving citizens. The ICT team at Plymouth, when benchmarked against other authorities, was already a lean operation, so the obvious answer to providing continual service improvement with the same resource was to adopt the ITIL framework. To fulfil this ambitious project, Plymouth selected Supportworks ITSM. Plymouth City Council is now live with eight disciplines of ITIL including Service Desk, Incident, Request Fulfilment, Access, Change Control, Configuration, Problem and Service Level Management. In addition to building a Service Catalog, it is planning to implement Release Management in the near future and is working on improving other areas using several other disciplines including Event, Capacity, Availability and Knowledge Management. 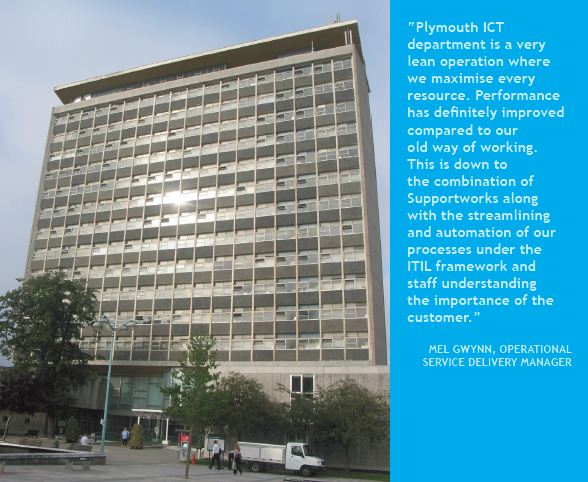 Plymouth ICT Service Desk supports 230 locations with 4,500 staff and councillors, including mobile workers, plus shared services with other authorities and users of the NHS network. They support over 250 applications and deal with over 1100 incidents, 800 service requests and 100 changes per month. The ICT department required a Configuration Management Database (CMDB) where every incident, problem and change would be linked to a Configuration Item (CI). Using the CMDB within Supportworks, the quality of data has been improved at point of capture. Supportworks provides automated scheduled reports, used during the department’s weekly meetings to discuss major incidents and problems. Supportworks also provides the data for reports circulated to the management team and customers. Each customer is registered on Supportworks automatically from Active Directory; eventually it is hoped that this will come from the HR system. A full Service Catalog will identify the services each user has access to. Supportworks also documents the business priority for both incidents and service requests through SLAs and has VIP customers configured to minimise business disruption, identifying key personnel. A key element in running the service desk smoothly was the initial collection of accurate data for each call. The department has now implemented a SelfService portal within Supportworks for its customers to log their service requests linked to a Line Manager Approval facility. Customers are still able to call the Service Desk, but they are encouraged wherever possible to use SelfService. Most elements relating to IT service provision are now kept in one central repository where they can be measured and analysed. The ICT department is able to respond to customers much more quickly with a better, more effective service. Keeping all asset information within Supportworks has enabled the team to manage service and maintenance contracts more effectively, leading to better management of budgets and a more efficient replacement programme. The elimination of rekeying data alone has saved three quarters of a post, which has been reassigned to implementing online confirmation management for requests received. The number of incidents dealt with by the service desk has increased over the last 5 months due to improved logging and resolution at the service desk and reduction in calls being reported to 3rd line teams. This has been met with current resource and is expected to now start reducing as improved information is allowing key areas and repeat incidents to be targeted. Reporting has also allowed hot spots to be targeted for further improvement.